Glenville Democrat’s Corcoran wins Adam R. Kelly Award; Spencer Newspapers again operates top newspaper in W.Va.
MORGANTOWN, W.Va. – Four West Virginia newspapers earned first-place General Excellence awards, which honor outstanding achievement by circulation division, in the 2016 West Virginia Press Association Better Newspaper Contest. The General Excellence Award winners are The Charleston Gazette-Mail in Division I, The Journal of Martinsburg in Division II, The Hampshire Review of Romney in Division III, and The Record Delta of Buckhannon in Division IV. The results of the annual competition, which honors excellence in newspaper journalism, were announced Saturday, Aug. 6, during a banquet at Lakeview Golf Resort and Spa in Morgantown. 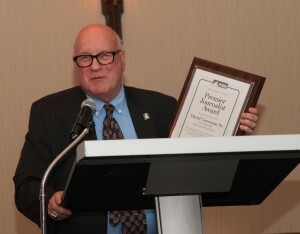 During the evening, David Corcoran Sr., editor and publisher of the Glenville Democrat, won the Adam R. Kelly Premier Journalist Award, the WVPA’s top individual honor. For the second year in a row, The Times Record & Roane County Reporter, owned by the Hedges family of Spencer Newspapers, won the West Virginia Press Association’s top newspaper honor: Newspaper of the Year. David Corcoran Sr., editor and publisher of the Glenville Democrat, won the Adam R. Kelly Premier Journalist Award, the West Virginia Press Association’s top individual honor during the WVPA Convention at Lakeview Golf Resort and Spa in Morgantown. WVPA Photo by Dalton Walker. Newspapers across the state compete in four circulation groups, two each for daily and weekly newspapers. The contest has 28 categories, ranging from Coverage of Government Affairs to Best Sports Feature Writing and Best Editorial Page. In 2016, 35 newspapers submitted more than 2,000 entries. The overall awards for General Excellence are based on total points earned in the basic categories. Division I (Dailies over 16,000 circulations): First place, The Charleston Gazette-Mail; second place, The Herald Dispatch, Huntington; third place, Parkersburg News and Sentinel. Division II (Dailies 16,000 and under): First place, The Journal of Martinsburg; second place, The The Bluefield Daily Telegraph; and third place, Times West Virginian of Fairmont. Division III (Weeklies over 4,000): First place, Hampshire Review, Romney; second place, The Times Record & Roane County Reporter, Spencer; and third place, The Spirit of Jefferson, Charles Town. Division IV (Weeklies 4,000 and under): First place, The Record Delta, Buckhannon; second place, The Moorefield Examiner; and third place, The Shepherdstown Chronicle.